The best planters don’t just give your favourite house plants, shrubs and trees room to flourish, they’re decorative features in their own right, which is great news. After all, if you’re already decorating your home and garden with flowers and foliage, why not go one better and find them a stylish home to shine from? Once you've chosen a favourite plant pot design, check out our sourcebook of garden suppliers for more garden shopping options. When selecting pots for outdoors, the first thing to think about is the material the pot is made from, as a handsome pot that quickly turns your beautiful plants brown and limp because it doesn’t offer protection from frost and biting winds can have the opposite of the desired effect. 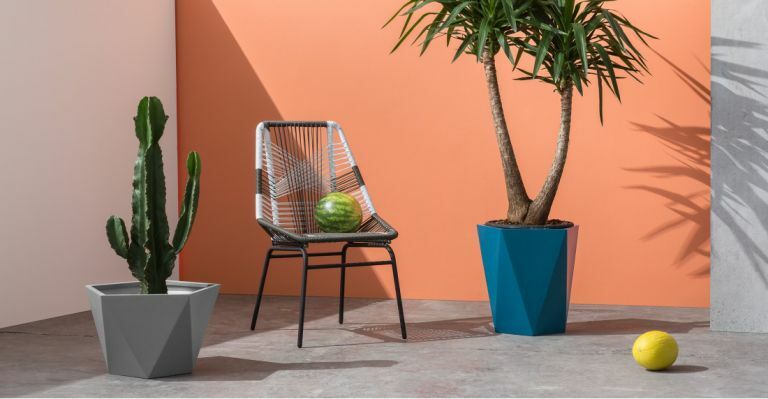 The Baloo Geometric Planters from MADE ace it on both fronts, with their on-trend faceted style and pioneering Fibrestone construction. For climbing plants, nothing beats classic timber in the form of a planter with built-in trellis, like our pick from Rowlinson. Indoors, of course, you’re in control of both the atmosphere and the aesthetic, so you can afford to go a little more unexpected. Retro hanging planters? Check. Minimal stand planters? Check. Precious metal-style containers for a luxurious look? Double check. Keep reading below to find your favourite. A planter with its very own built in trellis is the definition of horticultural multi-tasking, and this Rowlinson planter has the appealing design to back up the functionality, too. If you’d rather not (or cannot, in the case of those of us who rent) drill a trellis to a fence or shed, this trellis planter is an excellent, low-maintenance alternative. It makes an attractive home for climbing plants, and is large enough to accommodate deep-rooting varieties with a rustic, self-built look that’ll fit into a range of garden styles. Their animated namesake might have espoused the benefits of the bare necessities, but these planters are far from basic. With a super on-trend faceted construction and bold, block colours, they look decidedly futuristic; new neutral gunmetal grey creates a non-shouty backdrop against which to place the brightest blooms, while trendy teal creates a brilliant contrast with pinks and oranges. The material is pretty of-the-moment too, with these plant pots eschewing ceramic in favour of Fibrestone, a lightweight, weatherproof and very strong compound that’s perfect for outdoor planters. Cox & Cox have been coming up trumps with some wonderful options for outdoor living lately, and these rattan planters are the latest in a long line. In an attractive ball shape, they make an interesting alternative to the usual square-bottomed or cylindrical fare for those looking to make a statement with their shrubbery, and the natural rattan weave adds beautiful texture to rooms or outside spaces. There’s a discreet waterproof plastic liner pot hiding just inside, low-key enough not to disturb the rustic look of the planter, but capable enough to stop that over-zealous watering leaking through to the hall carpet. Container gardening is huge news for owners of not-so-huge gardens, but all enthusiastic plant-owners run out of room sooner or later. If you constantly find yourself tripping over pots of lovingly divided perennials, why not make the most of the vertical space available to you with a ladder planter like this one from Next? A gorgeous decorative feature in its own right, even if you’re not starved for space, its attractive slatted shelves provide a home for every pot that doesn’t have one, and you can position it in whatever aspect you need, sunny or shady, to give those little seedlings the best chance. Also makes a great home for garden tools. Reviewers were pleasantly surprised by how roomy these planters were, thanks in part to the straight cylindrical shape, as opposed to the tapered profile of many indoor planters, which makes them good for house plants with a spreading habit or wide-reaching root system. Of course, they also perform well in the style stakes, with a light, fresh combination of neutral ceramic and natural wood that not only feels considerable and beautifully should look at home in any modern space. With the look of a classic garden trug, only handleless, this sturdy planter is perfect for vegetables. Don’t have the room for raised beds but always wanted to grow your own? You’re in luck. Growing vegetables in containers is perfectly possible, as this specifically engineered option shows. It has a purpose-built fitted membrane to ensure your prospective produce has all the ventilation and drainage it needs, and also stands at the ideal height for comfortable tending and harvesting, so it won’t exacerbate sore backs. This indoor stoneware planter is a gorgeous eye-catcher in its own right, but it’s sure to really shine as a home for your favourite house plant. The turquoise reactive glaze gives it a rustic, hand-fired look, while the silver foiled base adds a hint of glamour. As it’s hand-applied, each one has a slightly different foil finish, which just adds to the individual charm. If you’re not sold on the colour scheme, there are grey-and-gold and lapis-and-silver variations, too. Those who made it through the interior trends of the 1970s might do a double take at the prospect of buying a hanging macrame planter in 2018, but take it from us: these throwback pots are huge news. And why wouldn’t they be? The rustic charm of the rope hanger, the gorgeous overlapping glaze effect of the ombré-effect planter, and the warm neutral tones come together to add interest to any corner. And the best part? That they hang from the ceiling means you don’t need surfaces or floor space going spare. Looking to make a real statement with your planting? This large elephant planter from Next should do the trick. Made from resin to give a gorgeously textured volcanic rock-like effect, but in a pared-back dark grey tone, it’s a standout without being outrageously difficult to mix with other pots. Despite its pumice-like looks, it’s actually made from resin, a material ideal for outdoor planters thanks to its non-porous, non-staining, weatherproof and durable characteristics.